Valise is a snooty kangaroo villager from the Animal Crossing series. Her name, "Valise," is a word that means a small piece of luggage, which may relate to her carrying her joey in her pouch. Valise is a grey kangaroo with white paws and a white tip of her tail. She wears pink eyeliner, and her initial item of clothing is the Rose Shirt. Valise has a black nose and pink inside her ears. At first glance, she appears to be a normal villager. In Doubutsu no Mori, Valise has blue skin instead of grey, and her expressions are different. Valise has a snooty personality, and will at first appear arrogant and rude, but can also be nice on occasion, depending on her relationship with the player. 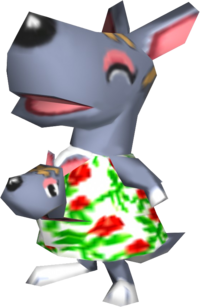 She will worry about her physical appearance and sense of style, usually relying on other villagers, including the player, to compliment her appearance. She will not get on well with lazy and jock villagers, who have conflicting lifestyles with her own - lazy villagers do not worry so much about their appearance or fashion statements, and jock villagers often subtly criticize other villager's fitness, both of which are the main concerns of the snooty personality. She will get along well with cranky villagers, however. For a small price, Valise will look into your mind and read your fortune. But be prepared. If you don't like what she says, you'll have to wander around wondering if she was right! Valise appears in the Animal Crossing instruction manual, on the page that details the typing interference. Modified on March 13, 2019, at 14:17.